Definitely football weather. Too bad I'm not into football. Hey - lighten up on the One Percent. Coke and meth and teeth. No, as in Coca-Cola. One more reason why on-line education will become the norm. The fact that dare not speak its name. Beans to cut. Later, druids. I'm certainly no stranger to cheap demagoguery, but this lump is a sad example of obfuscation and pandering at the same time. The U.S. population is now categorized as 16 percent rural. Despite that low percentage, more than 40 percent of the men and women who serve in our armed forces are from rural America. Young men and women from America’s farms continue to lead the way in protecting our country and making us the top military power in the world. Jeez - where to start! A. The author of this article is totally clueless here as well, and apparently unable to google "rural". He conflates "rural" with "farm". Let's try some of that fancy arithmetic stuff: 16 percent of the US population (~320M) would be over 50 million people. WTF! WE constantly remind people only 2% are farmers and we know that's a wild overestimate of the number of actual producers. So where are all these folks? B. To begin with, there are NINE (!) different USDA definitions of "rural". This excerpt leads me to believe Vilsack's speech inventor is using Definition 7. Wade through it yourself, but it's pretty clear it includes lots of what are clearly "city folk". It definitely doesn't mean "lives on a farm". C. I can't find a definitive source but anecdotal information suggests young people are not necessarily driven by fervent ideals so much as a lack of employment opportunity near home, the GI Bill educational benefits, and more chances of equal treatment for minorities. I'm not discounting patriotic motivation but it is not the only factor and there is no evidence to suggest it is stronger in rural youth. A better link is the much higher unemployment in the rural South especially. D. It is a tortured chain of logic to link national security to a farm bill and subsidies so farmers will keep supplying sons and daughters to fill soldier slots. Also a little nauseating, IMHO. Vilsack is scraping the bottom of the barrel here. While I am glad I served, I joined because I was going to be drafted and frankly for a little adventure at 21. It was one of the best decisions of my life, but I did not then nor now imagine myself doing anything heroic. It was my job for 5 years. They paid me to do it. The Secretary's cheap exploitation of military myths is undignified and uninformed by actual fact. While there were stark differences in salaries when I was choosing my major (almost 50 years ago), the gap has become truly shocking. 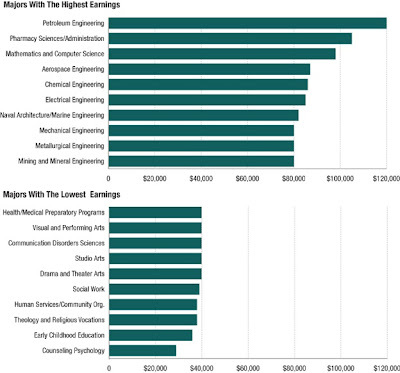 There are very sound reasons for this, but more to my point is the decreasing number of majors to fill in the middle. These gaps would be OK if not echoed all across our economy, with a clearer and clearer divide between "will-haves" and "will not haves". Sound reasons also do not seem to mitigate the consequences of vast inequality. Even if justly allocated, do we want to live in a society of rich and poor? More importantly to me, have we damaged many of the ladders that allow not only climbing up the ranks, but provide an avenue of recovery if you slip out of the top brackets. Scarily enough, we are raising the penalties for losing a job, catastrophic illness, and other career interrupting events. If you drop down, I think it is increasingly likely you will stay down. And so will your children. First field of beans about done. Not mine - can't say. Are firefighters the "brakemen" of the future? Any minute now, you'll hear one. Why I may be sold out by October 15. Is it me or is it droughty in here? Why most marketing strategies are useless (IMHO). We are kidding ourselves as producers if we think we are going to consistently outfox the market. The truth is we're not even in the real game. Now add in Black Box trading and I think drawing all the clever lines on bar charts is busywork for people who struggle with a random world. And boy, is it! The public relations struggle to define commercial farms. This Chipotle ad is getting rave reviews and could be going viral. I don't think we have good responses to counter these images. And passing ag-gag laws is really a step in the wrong direction IMHO. Meanwhile, the GMO battle I declared over seems very much alive. The real difficulty is the ideological argument here. Farmers want to maximize individual rights, and that's exactly what these GMO opponents are advocating. Forcing others to accept products because "we" or the government know what's good for them would never get a favorable reaction from farmers. It's the climate change position in reverse. This is also part and parcel of the devolvement of government action to the local level as state and federal regulation becomes less effective. For a tiny minority like farmers, supporting federal overrides is a really bad strategy. We've played fast and loose with science and thus enabled this kind of resistance. Actually, if GM companies and users are successful, I would be troubled by the implications for their own consumer rights. If we can force our views on others do we really thing it won't happen to us? From the list of "policies that aren't working like we thought they would", this interesting take on why monetary policy (interest rates) don't deliver the bang for the buck they used to. What’s the theory? To start with, monetary policy works by changing the cost of borrowed money. When growth is weak, a central bank cuts interest rates, which in turn makes spending, consumption, and investment more attractive. You’re more likely to buy a house or a car if the interest rate is 3 percent than if it’s 5 percent, for example. But crucially, the use of borrowed money is a crucial way that these lower rates translate into higher economic growth.But borrowing money is disproportionately an activity of the young. Economists call it “life cycle hypothesis of saving” — people use credit to smooth out what they can consume over the course of their lives. When just embarking on a career, a young person might take out major loans for education and for buying a house and car. As they reach middle age, they will tend to have paid down some of that debt while also building savings. By the time they hit retirement age, they should be net creditors, with significantly more savings than they still owe in debt. I find this idea persuasive. In fact, older Americans are beginning to despair at low interest rates, since they are on the receiving end of money rental. Meanwhile record low rates still can't seem to put m all the excess money to work. Case #2: Hunger. Here in agriculture our answer to growing food insecurity has been to pay farmers to grow more. But there are catches to this obvious solution, as well. Poverty and waste. In a 2012 paper, Rebecca Bratspies, of the CUNY School of Law, makes the case that increased food production is not the way to resolve food insecurity. Rather, the problem comes from food distribution. For the past decade, she says, food production has increased faster than population growth. Yet, in the past 35 years, the number of people experiencing food insecurity has nearly doubled: 500 million experienced hunger in 1975; by 2010, it was 925 million. Food production doesn’t alleviate poverty, Bratspies argues; it’s a “social commitment to an equitable distribution of food” that will actually help those suffering. Of course we have an answer for the problem of poor people not having enough money to buy the food we grow: government assistance. No - wait, I forgot. We're going to shutdown government in order to CUT food aid (SNAP), and send more of the farm bill $$ to well, me. Yeah, that makes sense. Case #3: Breakfast and obesity. We all know the right answer - breakfast is the most important meal of the day. But are we looking at cause and effect or simply correlation? In short, if you haven't learned to keep and open mind on as many beliefs as you can, you may be heading for rude shocks and future shock. We live in a complex world, as as it becomes ever more interlinked, teasing out what will happen when we do X is going to be tougher and tougher. Which is why I am a big supporter of random trials. Imagine if we could do that with the farm bill. For land prices. As asset bubbles are being spotted like financial Yeti all around the globe, people are trying to see some sense behind the prices. In this analysis about the boom in classic car prices see if the reasoning resonates with our favorite asset. From our vantage point — and it certainly is a lay vantage point when it comes to classic cars — there seem to be three core attributes associated with vintage automobiles.The first is uniqueness.Value related to uniqueness is understandable since it relates to how easily an object or item can be sourced, replicated or mass produced. For now, there is little chance that a classic Bentley will be perfectly replicated. Value applied on these grounds seems rational enough. The third point may be a bigger contributor to land prices than we think: land has continues to stand unchallenged as an historic form of wealth, and because it is intrinsically tied to location it also is a repository of history. To know an ancestor or beloved grandparent walked/bought/farmed an acre is to add the same type of value as knowing your childhood movie idol owned an item. Think of Spock's napkin or Jon Voight's car. Funny doesn't work without a wide acceptance of the underlying truth we feel. When it come to land next to me, it is truly a scarcity market. And given my conviction that extremely large amounts of liquid assets are looking for a long-term home, farmland could be a semi-scarce asset that can at times possess some attributes of fine art or a Duisenberg. This means that using tools that select the best stock for your 401K may not help when making land decisions, especially if you farm. Every now and then I see the claim marijuana is the "most valuable US crop". Reuters reported Dec. 18 that public-policy analyst Jon Gettman estimated the value of the U.S. marijuana crop at $35 billion annually, with California, Tennessee, Kentucky, Hawaii and Washington each producing more than $1 billion worth of the illegal drug each year. Gettman estimated the annual California marijuana crop to be worth $13.8 billion. First, this was 2006, so the commodity numbers are much lower than current prices, and it also uses street value - not "farmgate" - prices for weed. Finally, the estimate comes from a partisan source, not disinterested economists. Something smells funny about this claim (heh). So as the nations moves fitfully toward legalizing cannabis, what are some better numbers to estimate the importance of this ag product and its possible effect on the economy? Well, that turns out to be a tough question. I started by trying to find out large US consumption is. As you might guess, the estimates are even worse than NASS on the soy crop. But a more recent (2010) Rand study refutes this number. By this time I have reached the conclusions that 1) any economic analysis regarding farm income, tax revenue, or economic impact from legalization should be viewed with great skepticism, and 2) marijuana today probably is not close to being our most valuable crop. Great series from James Fallows on mid-American towns. If you have a connection to Holland, MI or Sioux Fall, SD, please check out his posts. If you don't, you'll still enjoy them. Squirrels - we hates them! Why I am bearish on interest rates. How to tell your pilcrow from your diple. The remarkable end of East Germany. Well done, indeed. Why demographers get gray. And is Lincoln now a girl's name? If you don't have a camera on the back of your combine or grain cart, please cough up the $200 to prevent a tragedy. Believe it or not, I never could understand the joke about "cow tipping". Mostly, I knew it to be absolutely impossible and failed the test of humor for sheer illogic. But obviously this fable is alive and well. Let's get this out of the way: Cow tipping, at least as popularly imagined, does not exist. Drunk young men do not, on any regular basis, sneak into cow pastures and put a hard shoulder into a cow taking a standing snooze, thus tipping the poor animal over.While in the history of the world there have surely been a few unlucky cows shoved to their side by boozed-up morons, we feel confident in saying this happens at a rate roughly equivalent to the Chicago Cubs winning the World Series.The evidence against cow tipping is immense, and backed up by both farmers and the laws of physics (more on that later), but the simplest bit of proof we can point to: YouTube. It even includes some serious math to back this up. I'm sure this will put an end to all those tremendously un-funny jokes. Our annual trip with our dinner club to the local lake for boating, overeating, and highly-disciplined wine consumption. And home before 10 pm.! After we explored the problems of Syria, and South African gold strikes, the conversation turned to nature, such as: Why do buzzards urinate on their legs? Is a two-year extension the next farm bill outcome favorite? I vote for the portable body scale and the silicone wine glasses. Cut beans in two weeks. No idea about yields. Meanwhile winds keep blowing the corn over. On the grain front, got a call from my closest grain dealer, asking me to change delivery of my remaining August corn to his elevator in southern Lancaster County. He is loading trucks to go to Georgia with corn and does not have enough in the bins to fill the trucks!!! Apparently there is an area that needs corn and likely does not have rail access. The trucks are hauling wheat to the flour mills in this area and taking corn back. Can you say 'long haul'. The story is there is corn nearby, but rain is delaying harvest, so they are coming to Pa, an already corn deficit state for 'surplus' corn. There are stories of some 1 million bushels still in bins in Pa however. I talked to a trucker who was loading corn out of a bin that the producer told him was 4 years old. I just wondered where he has been the last 2 years with an opportunity to sell in the last 14 months at 9.69 a bushel. I also realize that the truth sometimes can get in the way of a good story. Man, I have trouble keeping corn until June. I can't imagine 4-year old corn, but I've hear these stories all my life. We had trouble with bins picking up moisture this spring, so Maybe they dry it to 12% or something. Meanwhile, I have always needed to turn grain into money to like, buy groceries, and pay off loans, so maybe I never really had the right circumstances. FWIW, we had a storm last night to boost our August rain total to .51", which means it won't be a new record low. While there was modest wind, it sure broke a lot of corn over. Is it me or are new hybrids remarkably wind-sensitive?